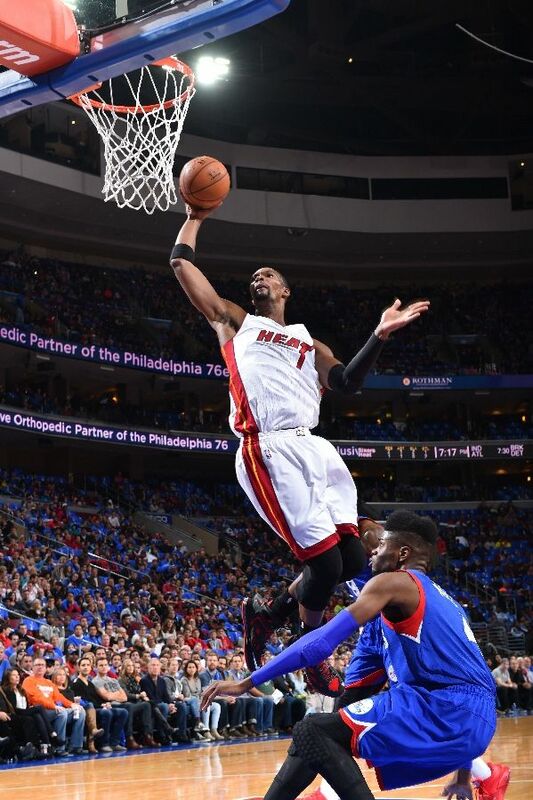 PHILADELPHIA, PA – NOVEMBER 1: Chris Bosh #1 of the Miami Heat goes up for a dunk against the Philadelphia 76ers during the game on November 1, 2014 at the Wells Fargo Center in Philadelphia, Pennsylvania. This is our newest Weekly Article for the NBA, The Rebounds(Best) & Blocks(Worst) of the NBA, lets take a look below from Week 1. Anthony Davis so far in 2014-2015 season: New Orleans Pelicans Power Forward Anthony Davis has started off great with 28.5 points, 16.0 Rebounds & 6 Blocks per Game. If Davis continues on this pace the Pelicans will be in the playoff race in the Wild Wild West. Chris Bosh so far in 2014-2015 season: The Miami Heat are the only undefeated team in the Eastern Conference & it’s mainly because of Chris Bosh, Bosh is averaging 25.7 Points, 11.3 Rebounds, 4.0 Assists & is averaging .545% from 3 Point Range. Bosh is back to playing the way he played in Toronto. Clay Thompson as your leading scorer after 3 games in the NBA: Golden State Warriors Guard Clay Thompson is the leading scorer in the NBA after Week 1, Thompson is averaging 29.7 points a game, including a career high 41 points vs. the Lakers on Saturday Night. The LA Lakers 1st 4 games in the 2014-2015 Season: The Lakers are the only team in the Western Conference that doesn’t have a win & this is why: The Lakers Point Differential is the worst in the NBA at a -17 with the Lakers giving up 118.0 points a game, also opponents are shooting .505% vs. the Lakers Defense & getting to the line 35 times a game. The Lakers right now on defense are just bad right now & are the worst team in the Western Conference. Detroit Pistons Offense: The Pistons are just averaging 86.7 points a game after 3 losses, the Pistons shooting pct is a woeful .402 & are only hitting 4 three pointers a game(3 point pct @ .219). The Pistons have to do better in scoring points to win some games in general.